The skin is one of the sensitive part of our body and it should be taken care of because a healthy and glowing skin gives an additional confidence. Having a year of skin breakout when schooling, it brought less a chance to look friendly to new friends and acquaintances. It is difficult when covering up with make-up that contains chemicals that may brew and irritate the skin more. Switching to healthy food intake is one step. Clara International has been 15 years (?) have the good practices of using natural products guided by professional organization and uses the best equipment to identify our skin problems. They admittedly told their patrons that the results would take some time and that's natural way of our tissues to regenerate. Forcing to get the quick result may lead to damaging the skin for longer term. I got under a consultation using their box device that had shown me the galaxy on my face. The stars were the white heads and the hues of violet were the uneven skin tone I received from not using sun block. They recommend I should start investing on my skin before its too late. They offered deep cleansing method the initial session to have healthy skin. It's a two hour relaxation, I meant duration. I would acknowledge the staffs patience and punctuality on schedule when I was given 10-15 minutes to let the product still on my face, the staff came back to me on spot. The staffs were friendly and certified nurses. The rooms were clean, air-conditioned and have soothing music. They have two clinics currently in Philippines, the one pictured above is their branch in Quezon Avenue, Quezon City near corner of Timog and West Avenue. The other one is in Greenhills. Clara International is a brand that originated in Malaysia as established by Dr. Clara L. Dee. 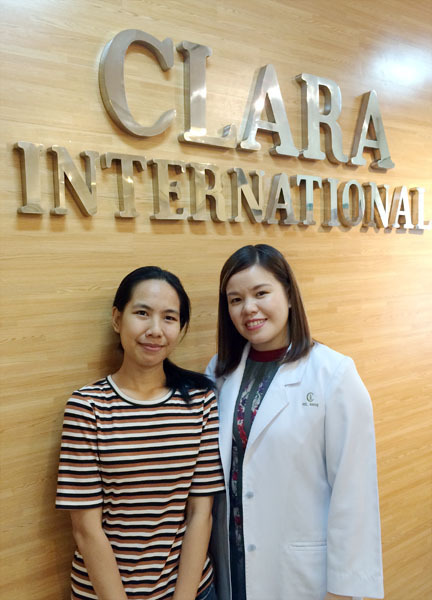 She realized that most skin care products/ programs were not researched and prepared for asian skin, which were much different with caucasians thus Clara International was born. Now spanning seven countries, it has now expanded from clinics to an academy and manufacturing facilities. Ensuring top quality, Clara International has been expanding ever since. For more information about their full line of services, visit their website here. Their facebook page is here for more inquiries.